Child sexual abuse cases are often not prosecuted because of poor evidential quality of the child’s investigative interview, the central plank of evidence in these cases. There has been limited research on child testimony from a prosecution (as opposed to developmental memory) focus and most of this prosecution work has been qualitative in nature, focusing on eliciting prosecutors’ perspectives of CSA interviews via surveys, focus groups, and in-depth interviews. Overall, the perspectives of prosecutors have received little airplay in the literature, yet they provide an important foundation for improving interview process and justice outcomes. 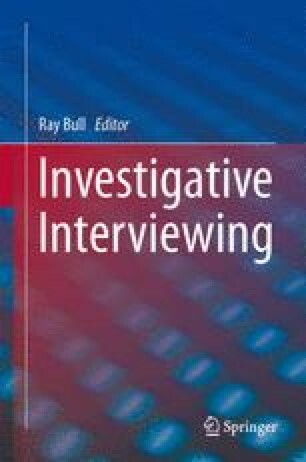 This chapter provides a review of the prior research regarding the persuasiveness and usefulness of child witness interviews as evidence. Four conclusions are drawn which have implications for interviewer trainers and policy makers. First, prosecutors support the system of electronically recording child witness interviews over the traditional system which involved the taking of written statements. Second, prosecutors perceive that interviewers need to become better attuned to the evidential details required for successful prosecution of CSA cases. Interviewers tend to overestimate the amount of contextual and time-related information that is required. Third, interviewers need to prioritise the elicitation of a cohesive narrative account of the offending from the witness perspective as opposed to using mainly short-answer questions. Finally, while prosecutors support electronic recording of child witness statements as evidence-in-chief at the trial, they believe there needs to be scope to supplement these interviews with additional live witness evidence. This chapter elaborates on these conclusions and describes the research that has underpinned them. Burton, M., Evans, R., & Sanders, A. (2006). Are special measures for vulnerable and intimidated witnesses working? Evidence from the criminal justice agencies. Home Office Online Report. http://collection.europarchive.org/tna/20080205132101/homeoffice.gov.uk/rds/pdfs06/rdsolr0106.pdf. Accessed 10 Nov 2012. Cashmore, J., & Trimboli, L. (2005). An evaluation of the NSW child sexual assault specialist jurisdiction pilot. Sydney: NSW Bureau of Crime Statistics and Research. http://www.lawlink.nsw.gov.au/lawlink/bocsar/ll_bocsar.nsf/vwFiles/r57.pdf/$file/r57.pdf. Accessed 10 Nov 2012. Criminal Justice Joint Inspection. (2012). Joint Inspection report on the experience of young victims and witnesses in the criminal justice system. http://www.hmcpsi.gov.uk/documents/reports/CJJI_THM/VWEX/CJJI_YVW_Jan12_rpt.pdf. Accessed 11 Nov 2012. Hanna, H., Davies, E., Henderson, E., Crothers, C., & Rotherham, C. (2010). Child witnesses in the New Zealand criminal courts: A review of practice and implications for policy [online]. The Law Foundation: New Zealand. http://www.ipp.aut.ac.nz/__data/assets/pdf_file/0020/119702/Child-Witnesses-in-the-NZ-Criminal-Courts-full-report.pdf. Accessed 2 Oct 2012. McConachy, D. (2002). Evaluation of the Electronic Recording of Children’s Evidence: Final Report. http://www.community.nsw.gov.au/docswr/_assets/main/documents/policy_evaluate_evid.pdf. Accessed 10 Nov 2012. Price-Robertson, R., Bromfield, L., & Vassallo, S., (2010). Resource sheet: The prevalence of child abuse and neglect [online]. National Child Protection Clearinghouse, Australian Institute of Family Studies. www.aifs.gov.au/nch/pubs/sheets/rs21/rs21.html. Accessed 14 Oct 2011. Richards, P., Morris, S., Richards, E., & Siddall, K. (2007). On the record: Evaluating the visual recording of joint investigative interviews with children [online]. Scottish Executive Social Research, Edinburgh. http://www.scotland.gov.uk/Resource/Doc/162579/0044250.pdf. Accessed 12 Nov 2012. Stern, V. (2010). The Stern Review [online]. http://webarchive.nationalarchives.gov.uk/20110608160754, http:/www.equalities.gov.uk/PDF/Stern_Review_acc_FINAL.pdf. Accessed 10 Dec 2012. Taylor, N., & Joudo, J. (2005). The impact of pre-recorded video and closed circuit television testimony by adult sexual assault complainants on jury decision-making: An experimental study. Canberra: Australian Institute of Criminology. http://www.aic.gov.au/publications/current%20series/rpp/61-80/rpp68.html. Accessed 10 Nov 2012. Washington Association of Prosecuting Attorneys. (2005). DVD recording the forensic child abuse victim interview: Washington state’s pilot project 2003–2005 [online]. http://www.waprosecutors.org/docs/05finalDVD.pdf. Accessed 18 Jan 2013. World Health Organisation. (1999). WHO recognises child abuse as a major public health problem [online]. www.who.int/inf-pr-1999/en/pr99-20.html. Accessed 10 Dec 2011.